Funzy01274 306822work Theme ParkFunzy a unique inflatable theme park located at Leisure Exchange Bradford. With an incredible layout, this one of a kind Indoor inflatable theme park provides an outlet for active children, teenagers and adults during inclement weather or when the temperature is too hot or cold for outdoor activity. Funzy provides a safe, clean, and stimulating environment as well as place for physical activity for children and families to play and explore. 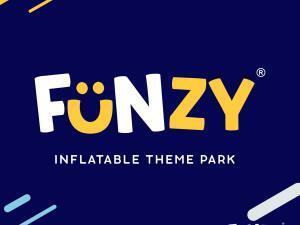 Funzy’s supervised, visually open play area will ensure people of different age group safety. The play areas are inflatable with extensive padding and no sharp edges. Funzy desires playtime to be as rewarding for the parents as it is for the children. The play areas are inflatable with extensive padding and no sharp edges. Funzy desires playtime to be as rewarding for the parents as it is for the children. Look out for the adults only sessions, as well as ladies only sessions with fitness classes incorporating Zumba, which is an aerobic fitness exercise performed to music. Funzy, interact, explore, and have fun!